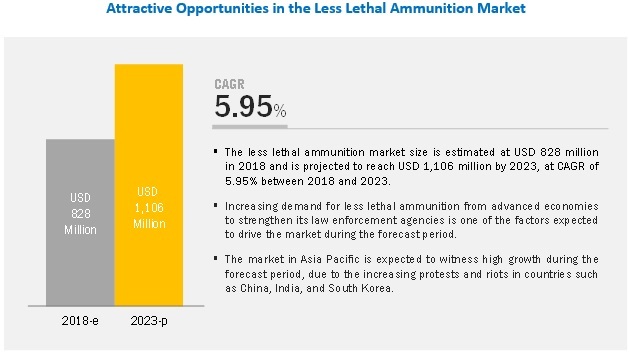 [156 Pages Report] The less lethal ammunition market is projected to grow from USD 828 million in 2018 to USD 1,106 million by 2023, at a CAGR of 5.95% during the forecast period. Factors such as the increasing demand for less lethal ammunition such as rubber bullets, bean bag rounds, and smoke munitions across the world are expected to drive the less lethal ammunition market during the forecast period. By end user, law enforcement segment is projected to grow at the highest CAGR during the forecast period. Based on end user, the less lethal ammunition market is segmented into law enforcement, military, self-defense, and others. The law enforcement segment is projected to grow at the highest CAGR during the forecast period. The growth of this segment can be attributed to the rising trend of militarization of law enforcement agencies worldwide, along with increasing incidences of political disputes and civil unrest. The rubber bullets segment is expected to lead the less lethal ammunition market during the forecast period. Based on product, the rubber bullets segment estimated to lead the less lethal ammunition market in 2018. Due to an increase in protests and riots across the world, most countries prefer rubber bullets to bring situations under control. For example, In 2018, the police personnel in Gauteng used rubber bullets to disperse about 2,000 workers belonging to the National Union of Public Service and Allied Workers (Nupsaw), who were protesting outside Dis-Chem's office in Midrand, Johannesburg. In addition, the police of Argentina fired rubber bullets at protesters who marched in front of the Congress against the upcoming 2019 Budget Bill, which contains steep spending cuts aimed at erasing the country's fiscal deficit. North America expected to be the largest market for less lethal market during the forecast period. North America is expected to lead the less lethal ammunition market during the forecast period. One of the key factors driving the market is the continuous upgrade of non-lethal weapons and munitions with the latest technologies. The US is the major country increasingly investing in less lethal ammunition and related technologies. Key players profiled in the less lethal ammunition market report include The Safariland Group (US), Combined Systems, Inc. (US), Federal Ammunition (US), Nonlethal Technologies (US), Rheinmetall AG (Germany), ST Engineering (Singapore), Security Devices International, Inc. (US), Lamperd Less Lethal, Inc. (Canada), Condor Non-Lethal Technologies (Brazil), Less Lethal Africa (South Africa), MAXAM Outdoors S.A. (Spain), and Sellier & Bellot (Czech Republic), among others). Acquisitions, agreements, and new product launches were the key strategies adopted by the industry players to achieve growth in the less lethal ammunition market. Defense Technology, a brand of The Safariland Group, launched 40mm Blunt Impact Projectile (BIP) Collapsible Gel Rounds. Rheinmetall received a contract worth USD 3 million from the US Marine Corps to supply day and night-capable 40mm x 46 practice cartridges. These cartridges contain no environmentally damaging substances and are being produced by American Rheinmetall Munitions, Inc.
Lamperd Less Lethal, Inc. announced the signing of an agreement with Defense Optics Group Corporation that deals with dealers in the UK, Africa, Canada, and the US. How will the drivers, challenges, and opportunities for the less lethal ammunition market affect its dynamics and the subsequent market analysis of the associated trends? What are the key sustainability strategies adopted by leading players operating in the less lethal ammunition market? Who are the upcoming disrupters in this market that can be potential targets for partnership/mergers? Who are the top players operating in this market? Where are the new geographies that can be potential revenue pockets for less lethal ammunition? 12.5 Security Devices International, Inc.
12.7 Mace Security International, Inc.
12.11 Lamperd Less Lethal, Inc.
Table 2 Weapons & Equipment Used By Swat Teams in the U.S. The research study that was conducted on the less lethal ammunition market involved extensive use of secondary sources, directories, and databases such as D&B Hoovers, Bloomberg Businessweek, and Factiva to identify and collect information relevant to the market. Primary sources that were considered included industry experts from the less lethal ammunition market as well as preferred distributors, suppliers, manufacturers, solution providers, technology developers, alliances, and organizations related to all segments of the value chain of this industry. In-depth interviews with various primary respondents, including key industry participants, Subject Matter Experts (SMEs), industry consultants, and C-level executives were conducted to obtain and verify critical qualitative and quantitative information pertaining to the less lethal ammunition market as well as assess the growth prospects of the market. The market shares of companies in the less lethal ammunition market were determined using secondary data made available through paid and unpaid sources and analyzing the product portfolios of major companies operating in the market. These companies were rated based on the performance and quality of their products. These data points were further validated by primary sources. Secondary sources that were referred to for this research study on the less lethal ammunition market included financial statements of companies offering less lethal ammunition and information from various trade, business, and professional associations, among others. The secondary data was collected and analyzed to arrive at the overall size of the less lethal ammunition market that was further validated by the primary respondents. Extensive primary research was conducted after acquiring knowledge about the current scenario of the less lethal ammunition market through secondary research. Several primary interviews were conducted with market experts from both, demand- and supply-side across five major regions, namely, North America, Europe, Asia Pacific (APAC), the Middle East, and Rest of the World. This primary data was collected through questionnaires, emails, and telephonic interviews. Both, top-down and bottom-up approaches were used to estimate and validate the size of the less lethal ammunition market. Key players in the less lethal ammunition market were identified through secondary research, and their market shares were determined through primary and secondary research. All percentage shares, splits, and breakdowns were determined using secondary sources and were verified through primary sources. All possible parameters that affect the markets covered in this research study were accounted for, viewed in extensive detail, verified through primary research, and analyzed to obtain the final quantitative and qualitative data on the less lethal ammunition market. After arriving at the overall size of the less lethal ammunition market from the market size estimation process explained above, the total market was split into several segments and subsegments. 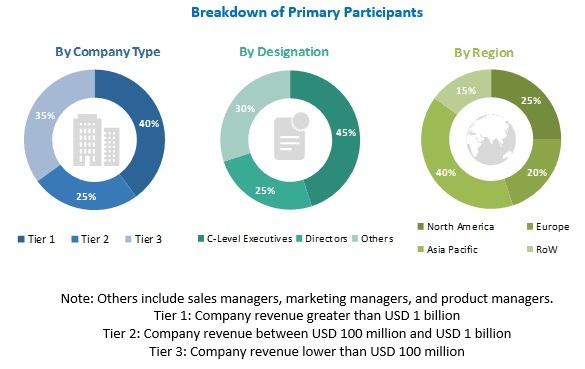 The data triangulation and market breakdown procedures explained below have been implemented, wherever applicable to complete the overall market engineering process and arrive at the exact statistics for various market segments and subsegments. The data was triangulated by studying various factors and trends from both, demand- and supply-side. Along with this, the market size was validated using both, the top-down and bottom-up approaches.